In line with the Company’s strategy, which places the customer at the heart of the business, during 2017 the DIA Group continued to work on introducing new functionalities into its customer listening systems, thus obtaining more precise knowledge about consumers’ needs and faster response times from the different areas of the company. The company gets close to customers through two channels: the request channel, whereby customers who are members of Club DIA are asked to take part in a quick survey about their shopping experiences. The second channel is the voluntary channel, whereby any customer who so wishes can fill in the survey on the company’s commercial website or on the mobile application. The issues covered in these surveys mainly relate to the shopping experience, with issues such as customer service, the evaluation of slogans such as “Customer Journey”, the assortment, and store maintenance. The e-commerce area also has its own personalised surveys, which mainly ask customers about their experience while placing the order and the receipt of the delivery. Make it easier to identify gluten-free products for coeliacs Increase in the range of SKUs approved by the Spanish Federation of Coeliacs, using an associated pictogram. The improvement of customer knowledge was in focus in 2017, with the “Client Experience” project, whose aim is to listen to customers and provide a faster response to the demands of both general customers and loyalty customers. Through the so-called “voice programmes”, the company is already able to obtain real-time feedback from its customers in Spain. In 2017, the company extended its customer listening systems developed in Spain to its stores in Portugal, Argentina, and Brazil, leveraging the potential of the new digital tools that allow it to enhance its two-way relationship with consumers. In total, during 2017, more than 9 million customer satisfaction surveys were sent to the customers of physical stores and e-commerce stores, with a response rate of over 5%. These customer listening systems are complemented by information contributed by the so-called “Customer communities” that were developed years ago so that they could provide a particular view of the business and highlight areas of improvement. For the last four years, DIA Spain has focused on a community known as “Demos la Vuelta al DIA”, whereby, through relationship marketing, cooking tips are shared, along with news and other information of interest for foodies in their different social network profiles. During 2017, “Demos la Vuelta al DIA” focused on promoting the company’s own-label products, conducting in-store product tastings to make its customers aware of the products. At the end of 2017, the company had organised more than 400 events focused on promoting its own-label products. DIA Spain has a magazine for loyalty customers called “Club DIA”, which has a circulation of 700,000 copies. This magazine offers content related to food, commercial developments, recipes, or practical tips around the house. In addition, the last two pages include discount coupons that can be used by customers who are members of the loyalty club. A community of DIA’s regular customers with whom the company can exchange information about their experience and needs was created in Argentina four years ago. Under the name “Expertas en Ahorro” (“Experts in Saving”), a project was launched that now has a huge following in the country, with more than 3 million members as of the end of 2017, its own YouTube channel, and an annual meet-up of “Expertas”, which has become a high-profile event, in which artists and well-known people from Argentinean society take part. DIA Argentina has a monthly magazine entitled “Expertas”, which was created with the same aim of getting increasingly close to its customers. The magazine, which has a circulation of 55,000 copies, covers various issues related to family, health, fashion, events, wellbeing, ecology, horoscopes, pets, and others. The content is developed to match the tastes and interests of its readership: housewives and professional women of between 25 and 70. In addition to the direct link to the company, which is leveraged to implement improvement initiatives mainly related to the commercial area, the “Expertas” also benefit from various offers, event tickets and cooking workshops, and are informed about the company’s latest developments. During 2017, the company held the traditional annual “Expertas” meet-up, in the Gran Rex theatre in Buenos Aires, and this edition also commemorated the company’s 20 years of history in Argentina. More than 3,000 people took part, and the only condition was that they had to make a small donation of a toy or school supplies, which were subsequently donated to charity. As a result of this initiative, more than 3,000 books or toys were obtained, and, together with more than 5,000 non-perishable food products and cleaning products donated by the company, they were given to the Fundación Sí and Manos en Acción. Brazil also has its own community of loyalty customers, under the name “Especialistas en Economía” (“Specialists in Economy”), which celebrated its second anniversary in 2017. In line with the initiative in Argentina, the Brazilian version organises classes, workshops, tastings, and other activities focused on savings and to promote DIA’s products and business model to a wide community of customers. At the end of 2017, the “Expertas en Economía” community had more than 40,000 loyalty customers, who were involved in 44 meet-ups, in which more than 1,000 people took part. It also has a loyalty magazine called “Revista DIA”, with a circulation of 10,000 copies, and which covers offers related to DIA products and new company developments. The most efficient instrument that DIA can use to identify its customers’ needs and adapt its stores, products, and discounts accordingly is the Club DIA card. 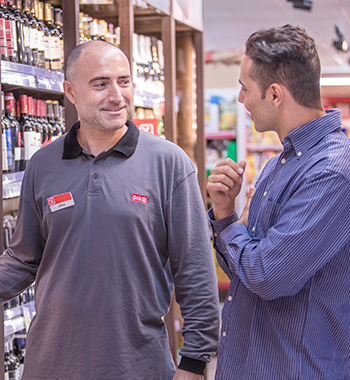 This loyalty system, which was a pioneering initiative in the retail distribution sector, provides exclusive advantages to card users, while allowing DIA to study their behaviour and thus prepare personalised sales plans. Just like a large number of initiatives implemented by the company, the loyalty programme was developed in-house 19 years ago now, and is a key tool when it comes to the company’s price image. In addition, it allows DIA to prepare, together with its suppliers, more efficient sales plans that are beneficial for both parties. Among the advantages that DIA provides to its customers to reward them for their loyalty, we highlight the access to more than 250 products with lower prices, fortnightly promotions, and discount coupons with offers of up to 50% off. In Spain, members can pay with their card or pay for their purchases in instalments, either weekly or monthly, through the credit company FinanDIA, which is subject to the supervision of the Bank of Spain, registered in the Spanish Registry of Credit Institutions (Registro de Entidades de Crédito) and associated with ASNEF (Asociación Nacional de Establecimientos Financieros de Crédito – National Association of Lending Institutions). Despite the differences and peculiarities in terms of consumption habits in different countries, the Club DIA card is still proving to be a valid model that can also be exported. New members are joining every year in the markets in which the company is present. Since the creation of the loyalty programme in 1998, DIA has already issued 41 million cards. The excellent response to the programme in DIA’s countries of operation was again evident during 2017: 77% of the group’s sales were generated using the loyalty card, and over 1.7 billion coupons were issued, along with 143 million online coupons. In order to ensure direct and streamlined communication with customers, social networks also play a key role, supporting both the commercial and corporate channels. In all the countries in which DIA operates, it also has a presence on the most widely used platforms, such as Facebook, Twitter, Instagram o Youtube. A user community of more than 3.5 million users across all of DIA’s countries is kept active thanks to communication on issues relating to offers, customer service, and new products. The customer relationship cycle is closed by making available to them formal claims and compensation systems, both locally and at a corporate level, thus protecting their consumer rights. During 2017, 128,267 requests were dealt with and analysed, including queries, suggestions and complaints, across all the countries in which DIA is present. During 2017, the company has made further progress with this strategy, adding a new corporate profile on Instagram, and which (like its existing profile on Twitter) serves as another window of communication in Spanish and English with external agents, extending beyond customers to include media outlets, shareholders, investors, non-profit organisations, and government institutions.